Peter Els is a retired composer who has found a new hobby. He has started to look for the beautiful patterns of music among the intricacies of microbiology and perhaps, to leave a bit of music on a strand of DNA. When the police show up on his doorstep, they find Peter's home laboratory suspicious and before he knows it, his supposed terrorist exploits have made him more famous than his music ever did. Peter runs away, reflecting on the journey that bought him to this point and turning to the people who have never left his mind and heart - his ex-wife, his daughter, his best friend, and his students as he decides where to go from here. Orfeo is told in dual storylines. In the present, Peter is on the run. He doesn't believe that he is guilty but he does want to tie up some loose ends before he turns himself in for a hopefully quick and painless investigation. As he travels, he delves back into his past - his love of music, his struggle to find a balance between making art and finding personal happiness, and the ways he let down the people he loved. Part of the genius of this novel is the way that Powers describes music. As someone who was raised in a musical home and still sings and plays, I found that he captured the ways that music stretches and changes us with beautiful precision. More than that, I think that the reader who is not a musician would be tempted to find a place for music in their lives after reading Orfeo. Peter and this story explore what music can accomplish and where its limits lie in the midst of its cyclical nature, as the composers and forms that were passe just a few years ago are suddenly new and exciting again. "Once, when he was young, Els had believed that music could save a person's life. He could think of nothing now but all the ways it might get a person killed. From the first leaping figure in the strings, Els heard again the problem with music. Even the slightest tune sounded like a story. Melody played on the brain like a weather report, an avowal of faith, gossip, a manifesto. The tale came across, clearer than words. But there was no tale." Peter wants what all artists want - that one perfect piece that will outlive him, that will make his friends and family proud to have known and loved him. But he has to balance the compulsion to create with the necessity to create and maintain bonds with those same people. "She'd given him years to make his mark - so many of them - and he hadn't delivered. And yet there was nothing, absolutely nothing at all he could gift her back, except this holdout search for what the world wouldn't give." 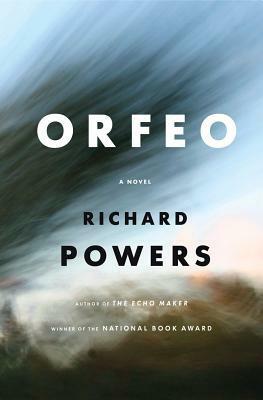 While reading Orfeo, we are treated to the rare author and rarer story that don't make the reader choose between science and art, gorgeous prose and a compelling story, or intellect and emotion. Els is just as likely to ponder the inner workings of a piece as he is to marvel over the story behind its creation. This gorgeous novel will make you marvel over the precision and beauty of language and all the while, it shyly suggests that you might want to give your dusty keyboard another look. I read one of his books during college and I liked it. This one I loved, though. This is such a wonderful review with a beautiful last paragraph! I'm more of a plot-oriented reader than one who enjoys prose, but it's nice when a book is strong in both areas. Intriguing review! I remember when this book was first released and I was on the fence about wanting to read it. I confess, I'm still on the fence about it because I don't think it's the book for me, but I loved reading your review of it. Thank you! This was one of those books that really stuck with me after reading it, so I am happy to talk it up. This book sounds like a really unique blend of writing & story. I'm looking forward to reading it. Lovely review! Hooray! I hope you enjoy it as much as I did. What a different kind of story. Did you ever find the dual story lines confusing? No, I don't think that I did. It was clearly delineated if it was the present or the past. The running-from-the-police thing doesn't sound like my sort of book at all. But the music aspects, especially since you say those are some of the best parts, now those are tempting! The running from the police thing is more of a vehicle for the story, I think. There aren't high speed chases or anything like that! Yay! I can't wait to hear what you think of it.